Sympodial orchids are one of the two main growth habits of orchids (monopodial orchids are the other kind.) These plants have a rhizome at the base (usually horizontal, at least when they are grown in pots), with a series of growths developing upward from it. A sympodial growth habit. This plant is growing mounted as an epiphyte, making its growth habit clearly apparent. If I recall correctly, this plant was a Brassia, or Spider Orchid. 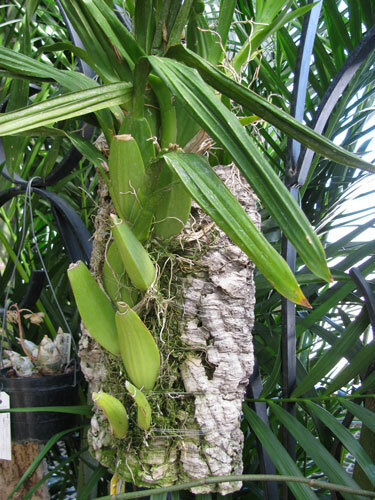 As the rhizome (the stem at the base of the plant) growth horizontally, it bends upward and develops into a small plant, with leaves, possibly a pseudobulb, and flower stems. After blooming, when the plant resumes growth an axillary bud at the base of the previous growth will begin growing another rhizome segment and the process is repeated. The old growth will not bloom again, but in some types of orchids may persist for many years. Eventually it will lose its leaves and, in orchids with pseudobulbs it is then called a "backbulb". After still more years it will eventually die off. Each new growth (or more precisely, the growth's apical bud) is called a "lead". Some plants will have just one lead, and produce a series of growths arranged along a line. In others, the rhizome may branch into multiple new leads if multiple axillary buds develop at the base of the growth; if this is repeated, the plant will develop into a large clump. Some types of orchids do this readily, others tend not to. When dividing orchids, the rhizome may be cut into pieces with 3-4 growths each, ideally with each piece containing one or more of the plant's leads. Backbulbs may develop new growths at their bases if they are separated from the rest of the plant and nursed back to health, but success is more likely if backbulbs are kept in groups of 3-4 as well.